A few years ago, artist Cody Hoyt sat in his Brooklyn studio and started to draw yet another still life, tinkering with text and elements of masonry on paper. That's when inspiration struck. "Switching media was the absolute best thing I could have done," he recalls of his decision to move into three dimensions. "If anything, it was embarrassing that I hadn't been making sculpture sooner." 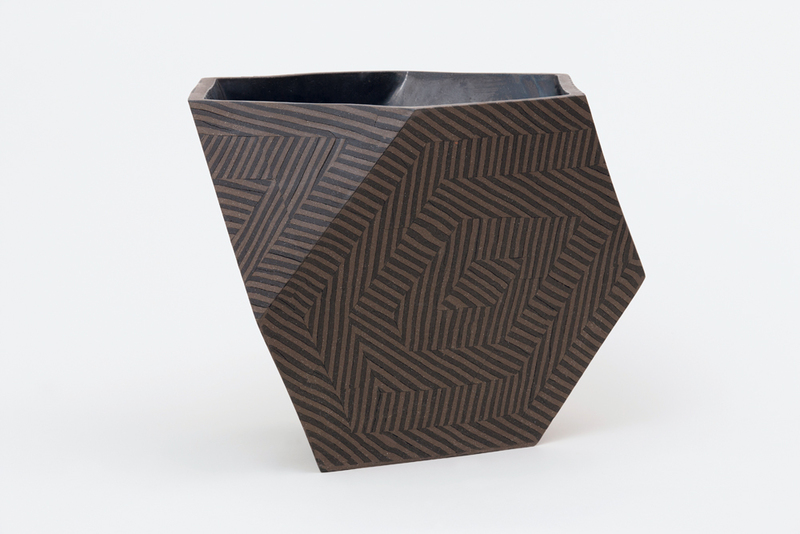 Hoyt began working with clay to produce highly geometric vessels patterned with bold graphics or slices of muted color. Many of his large-scale pieces have a structured but asymmetric tension and resemble cross sections of sediment seen in geology books. Born on the Gulf Coast of Florida, he was 18 when he moved to Boston, where he played guitar in a few bands. He soon enrolled at the Massachusetts College of Art and Design to study printmaking, a natural progression from the punk fliers he'd been assembling for gigs. After graduation, he relocated to Los Angeles and worked at the legendary printmaking workshop Gemini G.E.L., where he was able to experiment with studio materials. He remembers using the same blue chosen by Baldessari to create a skull poster for a friend. Hoyt landed in Brooklyn in 2011 and worked as an art handler while continuing to explore layered media. Fascinated by perfecting the systematic order of putting down paint or pencil, he experimented with dry and wet materials until the interest in shape and tactility was too much to resist. 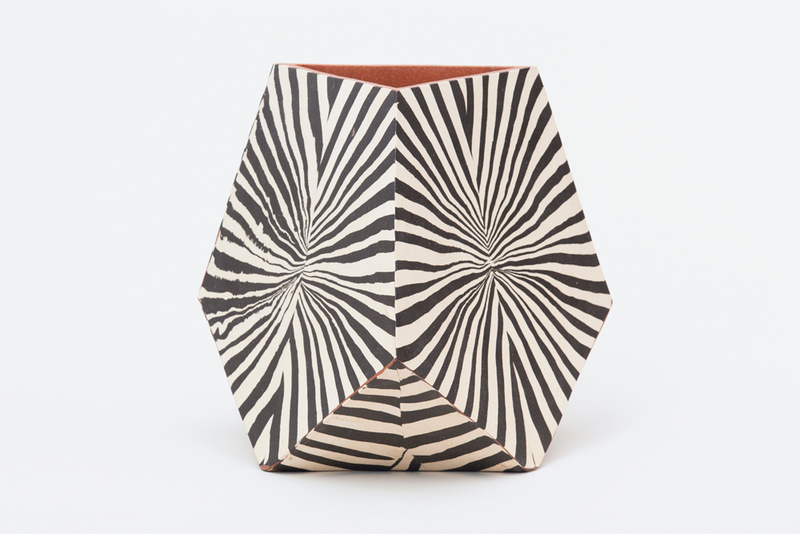 "That's where an interesting shift happens," he says of the variables involved with ceramics. "It's not about unfiltered creativity; that's too pure for me." None of his vessels have explicit functionality, and each is unique. Unlike many who work in the form, the 35-year-old artist refuses to use digital rendering. Each piece is engineered by his own hand. 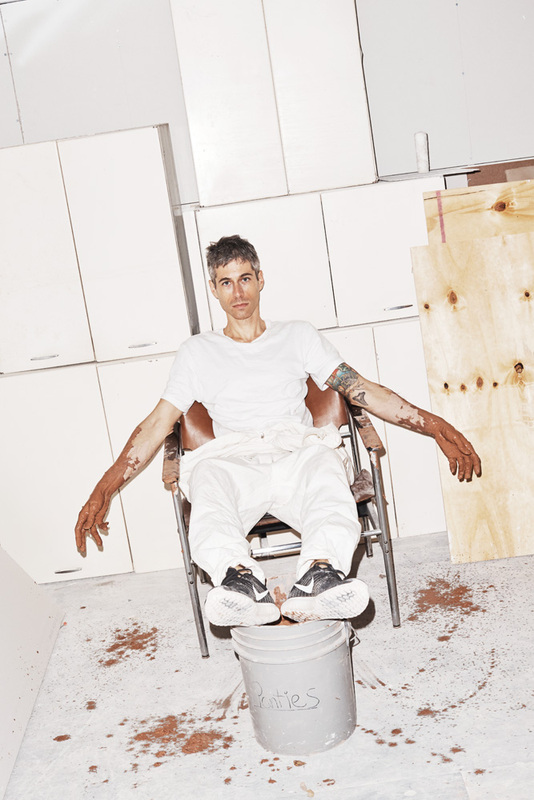 This month he opens his second solo show at Patrick Parrish gallery in New York, where his latest work will continue to explore his special brand of organic, geological figuration refracted through a punk-rock lens.